Although it's hard to overlook the low price tag, there are handsets out there with sub £100 stickers attached that overshadow the L3. Update: We've altered our review to reflect improved pricing on the Optimus L3 - does that make it any more worthwhile as a smartphone though? Some way off becoming a leader of the smartphone scene, LG's Optimus L3 is an entry-level handset that counteracts a less than groundbreaking array of specs, largely uninspiring styling and a less than fluid user experience with an impressive performance in the area that is arguably most important to its intended market, pricing. Lining up for as little as £79.95 on a pay-as-you-go basis or from £7.50 per month on a monthly contract, the L3 is one third of the Optimus L series and lines up as the smaller, lower-end sibling to the mid-market L5 and higer-end L7. Banking on its wallet-friendly price point to separate it from the expansive range of entry-level smartphones, the latest LG offering faces stiff competition from a flurry of more aesthetically pleasing, specs impressive and desirable devices from more coveted brands of the pocketable handset sector, such as Samsung and HTC. While the handset's sub £100 price tag will appeal to many, the minimalist price point comes at a cost with the handset's dated array of specs seeing the device line up with a number of its core elements, such as the screen and inbuilt camera, falling below the expected standards. Despite its widespread limitations, thanks to the device's 800MHz processor and few hardware demands, the LG Optimus L3 is rather zippy, with the sub-sized smartphone enabling you to freely scroll through the selection of Android 2.3 Gingerbread-enabled home screens and menus with ease, tackling the transitions in a simple, albeit low resolution manner. On first impressions the handset is largely disappointing with an extremely low-resolution touchscreen display providing heavily grained images and far from impressive visuals. These first impressions are only further compounded the deeper you delve into the handset's core. On the compact side of the smartphone spectrum, the 3.2-inch LCD TFT capacitive touchscreen offering found on the LG Optimus L3 is a frankly pitiful inclusion. Far from responsive, the QVGA feature boasts just a 320 x 240p image resolution with the low quality images further depleted by the minimalist 256K colour contrast ration and poor 125 pixels-per-inch image density. Although sure to attract many thanks to its extremely low pricing, the LG Optimus L3 features fewer bells and whistles, and a lower array of hardware features, than a number of its similarly priced rivals, with the £79.99 priced Orange San Francisco offering a superior 800 x 480p resolution display. Elsewhere the Alcatel OT-602 manages to utilise the same 320 x 240p resolution screen, albeit on a smaller scale, and the HTC Desire C runs the more current Android 4.0 operating system. Not all doom and gloom, there are areas of the hardware wars where the LG Optimus L3 comes into its own and manages to gain some much needed added credit. In a section of the market increasingly dependent on the use of microSD cards for any workable amount of internal storage, the L3 boasts 1GB of memory inbuilt. While the device can still be expanded up to 32GB via microSD, this full gigabyte base is a marked improvement on many of its sub 256MB touting rivals. 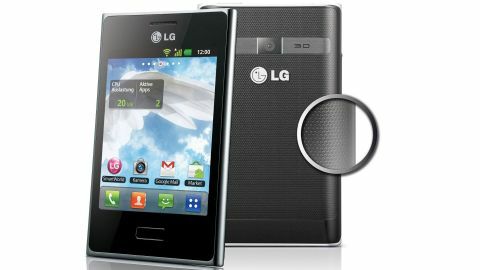 Fulfilling its role as a smartphone, the LG Optimus L3, like virtually all modern devices, offers you the standard collection of connectivity options with the now customary 3G and Wi-Fi abilities further enhanced by Bluetooth 3.0. In terms of internals, while Google's Android 2.3 Gingerbread OS is no longer at the fore of software potential, with no Android 4.0 ICS update to be made available, LG's decision to skin the L3 with its own Optimus 2.0 Lite user interface could be seen as a mistake. A less than fluid experience helps create a device that through a period of long-term use would quickly transform multiple small niggles into a series of massive molehills.